Predicting a game is hard … ask any athletic director in college football, who are often required to anticipate the quality of their opponents as far as a decade ahead. Contrast that challenge with the fact that TV networks rarely make scheduling decisions sooner than 12 days before broadcast. The variables are myriad. From weather to attendance, to finance … the conditions that affect the quality of a match-up can change drastically. Trying to fit 120 some-odd games into a weekend can lead to chaos, because weeknight games and match-ups spread all throughout the Saturday schedule. In the case of the Ducks, it means the second straight season with an 11:00 AM contest in Week 3. In fact, since the Ducks have moved their annual FCS game from the third to the first game of the season, Week 3 is developing a new annual distinction: the poorly-timed non-conference game. “Poorly-timed” in this instance, has a double meaning. While the early kickoffs might be less than ideal for optimal in-stadium energy, the timing also hasn’t been ideal in terms of the potential for an exciting match-up. In 2013, Oregon’s Week 3 contest against Tennessee led to a favorable 59-14 outcome, far from the clash of titanic programs it was expected to be. When it was scheduled a decade earlier, it made sense; the Volunteers were fresh off a national championship and Oregon was a top-two finisher. Instead, Oregon faced a rebooting Tennessee program under new coach Butch Jones, who was, himself, facing the first Power Five opponent of his tenure in Knoxville. 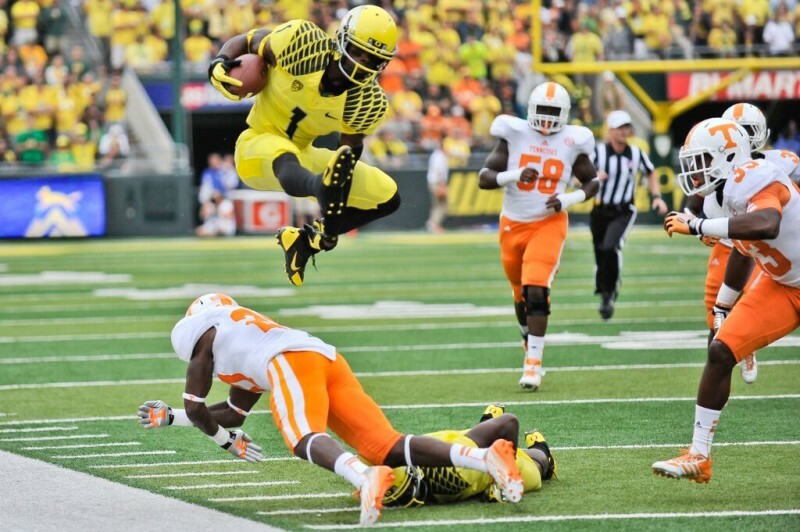 Josh Huff hurdles a defender against Tennessee in 2013. Same story in 2014, when the Ducks played a rebuilding but promising Wyoming team, whose new coach Craig Bohl, winner of three national championships at North Dakota State, was facing his first Power Five opponent as coach of the Cowboys. And while Georgia State may not be a program that instills fear in its opponents today, consider their emergence over the past six years – before the school even had a program. Combined with their potential for success by playing in a major market, in a talent-rich portion of the country, and at a school with larger enrollment numbers than Oregon, there is no reason why Georgia State can’t evolve into a competitive program in the future. After all, there was a time when thinking the Ducks — who didn’t win more than six games in a season from 1965-1989, including five nine-loss seasons over that span — would be the only college football program with only nine total losses for the entire 2010’s just two decades later, would have been complete lunacy. In a world where programs can maintain success for over a century, it can be difficult to realize that the landscape of college football does evolve. Service academies and Ivy League schools used to dominate the sport, as did a program such as Minnesota – don’t laugh, they were one of the most dominant teams of the first half of the 20th century. Oregon fans know first-hand that it can take forever and a day to build a program, but its fall happens much more quickly. We may know who dominates college football today, but tomorrow’s hierarchy is not secure. We may be witnessing a dynastic demise in real-time. In his chronicle of Urban Meyer‘s Florida experiment, ESPN‘s Jeremy Fowler – who you may remember as the reporter that Meyer “lost it” on in March, 2010 — explored the events that led to Meyer’s resignation, and the Gators’ eventual fall from grace. This year, Meyer’s Ohio State – the juggernaut that returns all its’ stars and was lauded as the first ever unanimous No. 1 preseason team — struggled to beat 34-point underdog, Northern Illinois, at home. Ohio State remained No. 1 this week, but not without exposing flaws that could hinder a repeat title. Why does that sound familiar? Shades of ’09 Florida, which brought back Tebow but lost Dan Mullen and didn’t look quite right. Year 1: Championship-level team with slight flaws — Florida won a national championship but had a loss, and Ohio State didn’t lose against a weak Big Ten, but was postseason ineligible. Year 2: Slight regression in results, good but not great team who struggled to win big games. Year 3: Wins National Championship following early season loss. Year 4: Top-ranked, widely celebrated, but visibly flawed team. The Buckeyes appear nearly certain to start 10-0, but games like the one yesterday provide only questions as to where Ohio State will go from there. 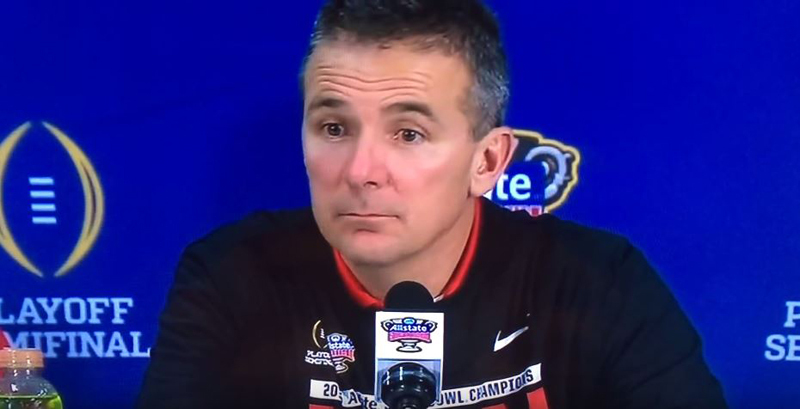 The catalyst of Meyer’s Florida demise was the head coach across the field in the 2009 SEC Championship: Nick Saban, a man who undoubtedly had an even worse day on Saturday than did Urban Meyer. Saban’s Crimson Tide became the highest-ranked team to lose this season, after falling to Ole Miss, 43-37, in a game that wasn’t as close as the score indicates … and it featured the coolest play of the college football season so far. The outcome was well-predicted last week by FOX Sports 1’s Tim Brando on the network’s “Audibles” podcast. Said Brando, “… from a football standpoint, Ole Miss is a better team than Alabama.” The podcast drew headlines for Brando’s assertion that Saban would retire sooner rather than later, stating, “… he’s setting himself up for an early exit from coaching.” Saturday showed at the least, the first part of Brando’s proclamation was right. Together, Saban and Meyer have won six of the last nine championships in college football. If their reign atop college football is coming to an end, who will emerge in their place? We should look for a team that won a lot of games, more than any other power five program in college football other than Saban’s and Meyer’s programs over the past ten seasons. It would be the only program other than Alabama to play in multiple national championship games this decade, and we would want a coach who was eight years younger than any coach in college football with a title game appearance. If you want to know that answer to which program fits all those criteria, you can probably venture a guess based on the site you are on. The voters may not think much of the Ducks this season. 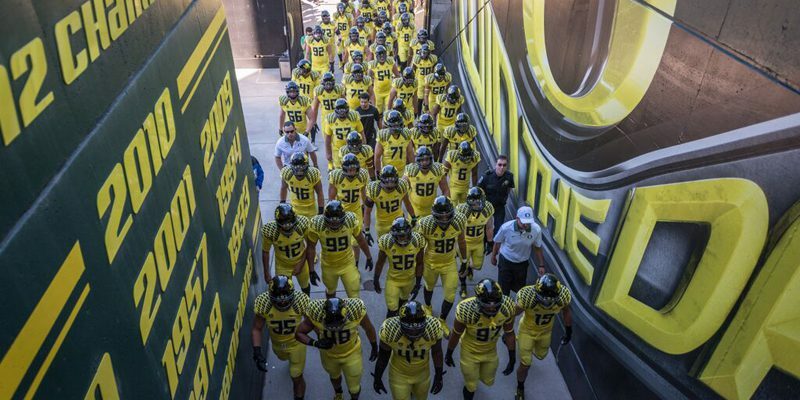 Despite their win, Oregon sank even lower in the polls. But if you hold any worry about the future of the Ducks — a young team in transition this season — fear not. There isn’t a program as primed for future success that isn’t also experiencing transition issues of its own this season. While Georgia State taught us little about the Ducks, we learned a lot about the landscape they will face. A king was dethroned this week, a titan fallen … but the future has arrived.